Restaurant São Cristóvão is a tiny place in Lisbon’s historical city center Mouraria, one of the oldest areas of Lisbon . Restaurant São Cristóvão is a favorite place among locals, with great food. You never pay more than € 7 for a dish. Mufete, a typical dish from Angola with fried fish, sweet potatoes, beans, peppers and cassava: € 6. Drinks: Super bock beer € 1. Ginja , liqueur made by infusing ginja berries, a favourite liqueur of many Portuguese: € 1,50. 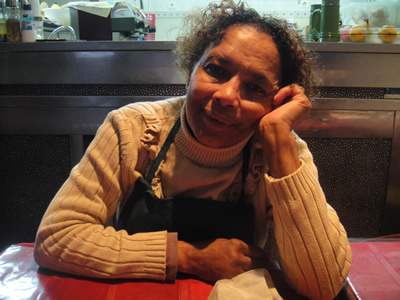 Maria Levy: ” I was born in Cape Verde , Santiago, the largest, greenest, most African island of Cabo Verde, one of Portugal’s former African colonies. 43 years ago I moved to Portugal and around 30 years ago I opened this restaurant in Alfama”. “We can provide seating space for up to 32 people”. And, after dinner: “You must try a ponche (punch) de Cabo Verde” (€ 2). History: the Cape Verde archipelago was uninhabited when the Portuguese discovered it in 1456. African slaves were brought to the Cape Verdian islands to work on Portuguese plantations. As a result, Cape Verdeans are mulattos (mestiços in Portuguese), who have mixed African and European origins. 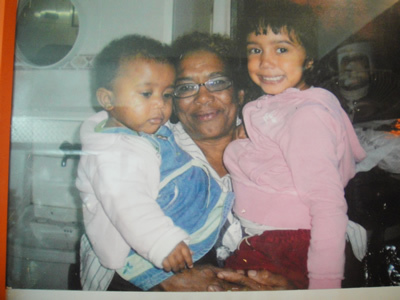 Maria Levy and her grandchildren. The walls in the restaurant are covered with paraphernalia from the Cape Verdian Islands and pictures. Cape Verde split away from Portugal in 1975, nowadays Lisbon is home to most of the Cape Verdean diaspora, although large communities are also to be found in Senegal, the north-east United States, Holland, France and Italy. 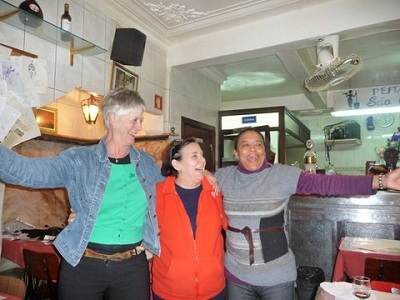 Maria loves the Afro-Portuguese music that fills her eatery and she invites people to dance after their dinner. 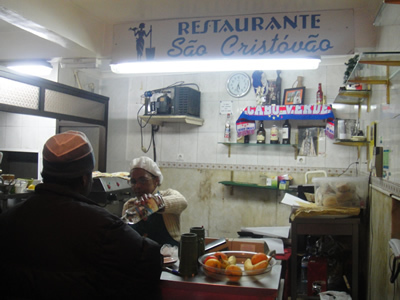 Restaurant São Cristóvão, Rua de São Cristovão 28-30, Mouraria Lisbon. Phone (00351) 914752102. Open from 12:00 to 24:00, also on Sunday. 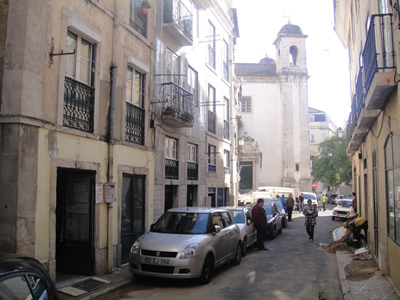 District Mouraria ( ‘where the Moors live’) is one of the oldest areas in Lisbon. 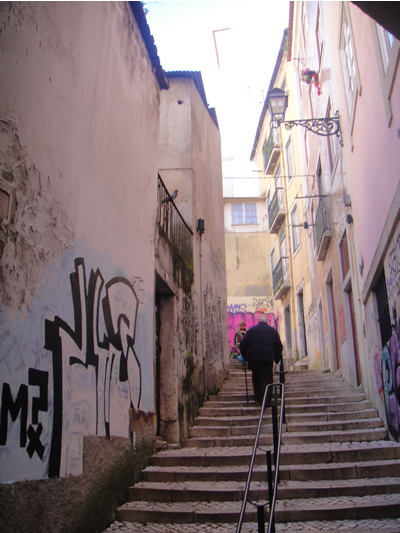 Nowadays the Moorish influence is still present, like the tiny streets and stairs. You feel like walking in a kasbah in the Middle Ages! 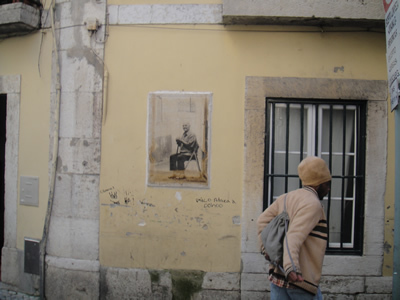 Rua de São Cristovão Lisbon, wall picture of Joaquim, a man who lived in this street. Created by British photographer Camilla Watson , who has been living in this area for 6 years. I am afraid it does not exist anymore. I found the place, but it was closed although it was around 3.00 p.m.
Last time I ve been there in February 2012 so I think it still exists. 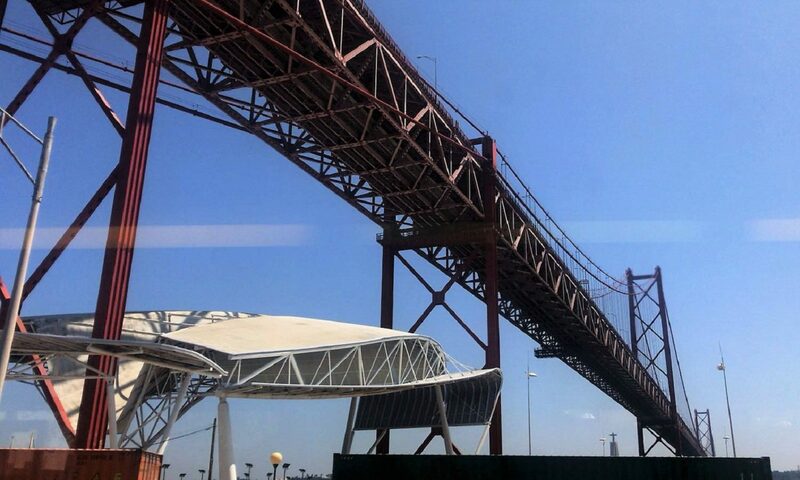 I ve been there few times between 2008 and 2012 (I am not living in Portugal but I try to visit this place once every time I am in Lisbon). I will always remember one funny story: my GF and me finished eating, paid and we left some tip and left. We were moving toward Rua Madalena when we found this lady Maria is calling us, she was on the street and we dont speak Portuguese so we just came back and didnt understand what is she talking and she gave us this ponch. It was great drink. I visited it yesterday, still open, still excellent. Good music, good food and the owner who sings Cesaria Evora standards for you. 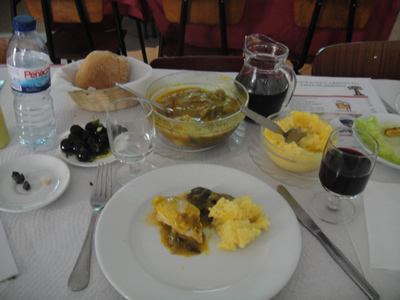 I am a portuguese client and I can tell you that this is not a good place as it looks… The owner wants you to eat and drink more things all the time. They put a lots of things that you didn’t ask on the table. Then when the bill comes you have a big surprise. Everyhting is false, even her smile and the jokes she tries to do. She only wants your money. When you pay, even the change will not come anymore, so becareful. The restaurant still exists. It is small but decent. Prices are not high and the dishes are fairly good. 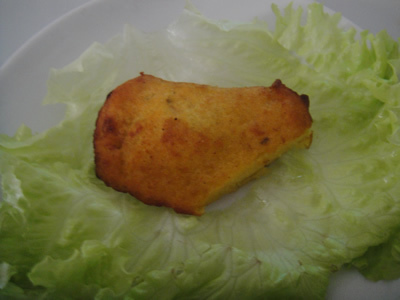 Do not expect haute cuisine, just simple meals for a fair price. The menu is not very well translated into English. Carapaus (translated as swordfish) turned out to be mackerel… So ask what it says on the menu before you order. I can recommend the Chicken in Peanut Sauce, a dish from Mozambique. The Rosé we had was good too: Mateus Rosé. I think it was 7 or 8 euro a bottle. We used to go to this place regularly in the 1990’s, it was amazing. I’d love to know if it is still there? ?